Miniature Nautical Figures 1" (12PCS). 2 Red Anchors, 2 Blue Anchors, 2 Blue Ship Wheel, 2 Red Sheep Wheel, 2 Red Buoys, 2 White Buoys. Mini Nautical Pick 12PCS. Six designs two of each. 2 Lifebuoys, 2 Crabs, 2 sailboats, 2 octopus's, 2 whales, 2 anchors. Mini Anchor Pick 12PCS. Pieces are 4". 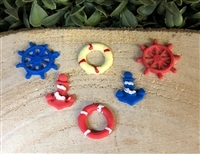 Anchors and Lifebuoys 12PCS. Anchors: 2" and Lifebuoys: 1.6"
Pink Nautical Flat Set 12PCS. 6 different designs and two of each. 2 Crabs, 2 Boats, 2 Whales, 2 Lifebuoys, 2 Octopus's, and 2 Anchors. Sailboat 12PCS. Pieces are 2". 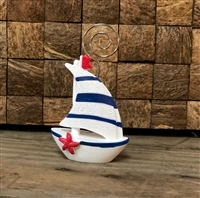 Stripe Sailboat 12PCS. Pieces are 2"
Baby on Sailboat 12PCS. Pieces are 2". 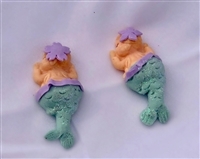 Baby Mermaid 12PCS. Pieces are 2.5". Blue Anchor 12PCS. 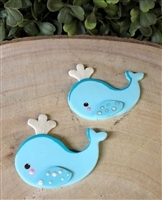 Pieces are 2.5"
Whale 12PCS. Length: 1.5" Width: 2"